Samsung Electronics Co Ltd. was the largest competitor with almost 11% of the market, followed by LG Electronics Inc., Sony Corp., Panasonic Corporation and Bose Corporation.The major companies in the audio and video equipment manufacturing market are Samsung Electronics Co Ltd., LG Electronics Inc., Sony Corp., Panasonic Corporation and Bose Corporation and Samsung Electronics Co Ltd. In March 2017, South Korean electronics company Samsung acquired Harman for $8 billion . As a part of this acquisition, Samsung aims to have its presence in the connected technologies, particularly automotive electronics industry. It is a part of Samsung’s strategy to grow to $100 billion by 2025. Harman International designs and engineers connected products and solutions for automakers, consumers, and enterprises such as including connected car systems, enterprise automation solutions, audio and visual products, and connected services. The countries covered are China, India, Japan, UK, Germany, France, Italy, Spain, Russia, USA, Brazil and Australia. The global audio and video equipment manufacturing market is expected to reach $278 billion, growing at a CAGR of 6% in the forecast period. This is mainly due to technological advances- the audio and video equipment manufacturing market is expected to be driven by technological advances and innovation in audio and video devices. Innovations such as IoT enabled speakers are likely to gain popularity. The internet of things (IoT) is a network of physical devices which can communicate over internet, and integration of IoT technology can lead to innovative audio and video devices. For example, companies such as Amazon and Google have launched IoT enabled speakers Amazon Echo and Google Home speakers, which can be used for home automation, and shrinking life cycle of consumer electronics- the lifespan of consumer electronics products including audio and video equipment is getting shorter driving increased purchases. This is expected to hinder the growth of the audio and video equipment manufacturing market in the forecast period. This can be attributed to rapid changes in technology and consumer preferences. For example, European consumers are upgrading to larger TV sizes, even though more than 60% of replaced televisions were still functioning in 2012. In Europe, the average age for a TV being replaced was only 5.6 years in 2012, and it is expected to decline further. However, the market for audio and video equipment manufacturing is expected to face restraints from several factors such as high degree of price competition -the audio and video equipment manufacturing market is characterized by intense competition. The competition in the market is primarily on the price. For example, Xiaomi, a Chinese mobile internet company, has entered into India with low-priced televisions, which is expected to disrupt the television market in India. These televisions have specifications of high-end televisions but are priced much lower than the competitors. The price competition is also intense in the premium TV market. The prices of ultra-high definition televisions are declining at a rapid rate. 4K TV prices declined from $8,000 in 2012 to $1,250 in 2015, and are expected to decline further and interest rate - interest rates are expected to increase in developed nations, particularly the USA and Europe, between 2015 and 2019. This will decrease the flow of cheap money available for investment, thus making it harder and more expensive for companies in capital intensive industries such as electronic equipment manufacturing to raise funds. For instance, in March 2018, the Federal Reserve hiked its federal funds target range by a quarter point to about 1.5%-1.75%.xlv This is expected to act as a restraint on the audio and video equipment manufacturing market. The audio and video equipment manufacturing market is segmented by type and by geography. By Type - The audio and video equipment manufacturing market into audio equipment market and video equipment market. The audio equipment is segmented into loudspeakers and sound bars, music players and other audio devices, microphones, amplifiers and mixers. The video equipment market is segmented into television, video cameras and video players. 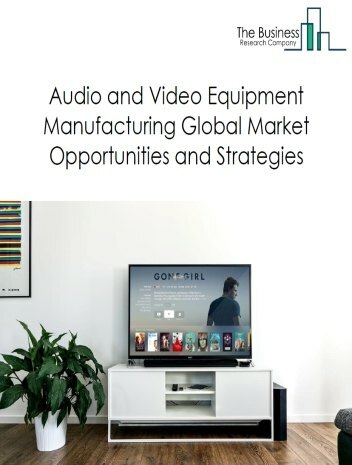 By Geography- The audio and video equipment manufacturing market is segmented into North America, South America, Asia-Pacific, Western Europe, Eastern Europe, Middle East and Africa. Asia-Pacific was the largest region in the global audio and video equipment manufacturing market with about 63% of the market. Asia-Pacific has a large consumer base for audio and video equipment in emerging economies such as China and India. This is primarily due to rising disposable income, large proportion of millennials and increase in access to internet. In 2017, with the launch of wireless speakers and OLED televisions in countries such as India, China, Japan and Australia, the overall market for audio and video equipment in the region is expected to grow. LED video walls are gaining popularity and are being widely installed in commercial establishments such as hotels, restaurants, stadiums stores and other places. LED video walls are made up of modular tiles which fit together in a magnetic or lockable display to enable creation of video walls of various sizes. These video walls are used to display advertisements or are used as monitor screens. According to Futuresource consulting, the NPP (narrow pixel pitch) LED video walls displays market is expected to grow at a CAGR of about 34% between 2015 and 2020 and the market is projected to reach $2.2 billion by 2020. With the emergence of smart cities, collaboration for environment protection and sustainable development at a global level, the scope and potential for the global environmental consulting industry is expected to significantly increase in the forecast period. 21.1.1.Semiconductor and Other Electronic Component Manufacturing was the larger of the two segments in the market at 62.7% of the market worth about $512 billion. 21.1.2.Audio and Video Equipment Manufacturing was the smaller of the two segments in the market at 37.3% of the market worth about $305 billion. LED Lights- Save Electricity, Save Money! The wires and cables market consists of the sales of new wires and cables by entities (organizations, sole traders and partnerships) that manufacture insulated fiber optic cables which are network cables containing strands of glass fibers inside an insulated case , and coaxial cables and other insulated nonferrous wires which are copper and aluminum wires used by industries including energy, automotive, telecoms and others . 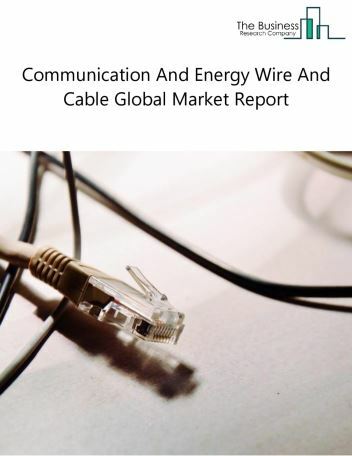 The wires and cables market covered in this report does not include sales from services, repair and maintenance of wires and cables. 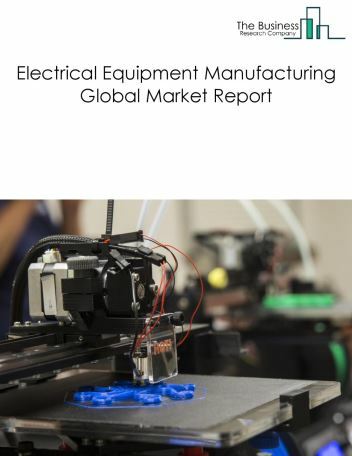 The global electrical equipment market, of which the wires and cables market is a segment, reached a value of nearly $1,047.4 billion in 2018, having grown at a CAGR of about 5.0% since 2014, and is expected to grow at a CAGR of about 7.9% to nearly $1,433.2 billion by 2022. 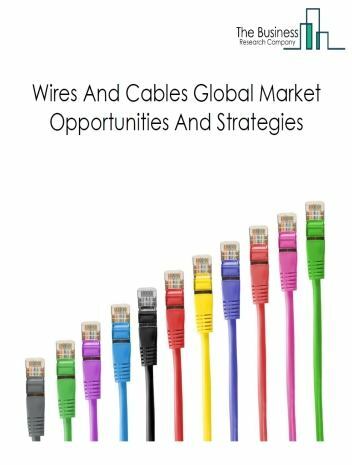 The wires and cables market is the fourth largest segment of the electrical equipment market accounting for 13.1% of the electrical equipment market. 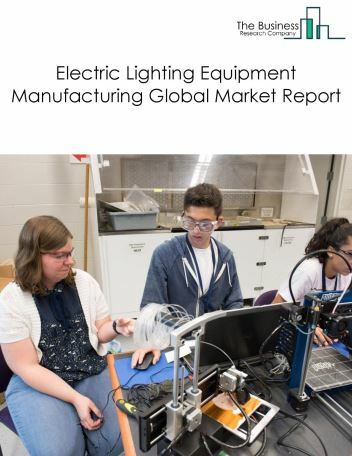 The electric lighting equipment manufacturing segment is expected to be the fastest growing segment in the electrical equipment market growing at a CAGR of about 9.5% during 2018-2022. The electrical equipment manufacturing market consists of sales of electrical and electronics by entities (organizations, sole traders and partnerships) that produce electrical and electronics. These include semiconductors, audio and video equipment and other electronic components. 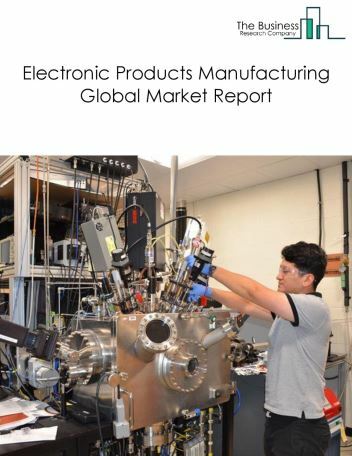 The electronic products manufacturing market consists of sales of electronic products by entities (organizations, sole traders and partnerships) that produce electronic products. These include semiconductors, audio and video equipment and other electronic components. The electrical lighting equipment manufacturing market consists of sales of electrical lighting equipment by entities (organizations, sole traders and partnerships) that produce electric light bulbs and tubes, and parts and components (except glass blanks for electric light bulbs) or electric lighting fixtures (except vehicular), nonelectric lighting equipment, lamp shades (except glass and plastics), and lighting fixture components (except current-carrying wiring devices). 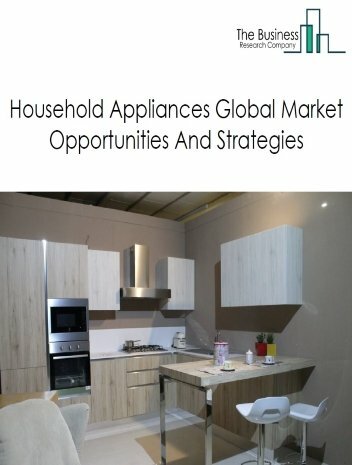 The household appliances manufacturing market consists of sales of household appliances by entities (organizations, sole traders and partnerships) that produce small electric appliances, electric housewares, and major household appliances. 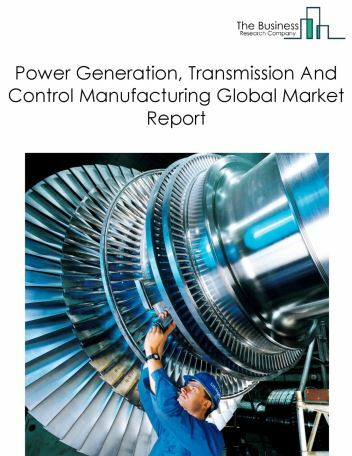 The power generation, transmission and control manufacturing market consist of sales of power generation, transmission and control equipment by entities (organizations, sole traders and partnerships) that produce power, distribution, and specialty transformers; electric motors, generators, and motor generator sets; switchgear and switchboard apparatus; relays; and industrial controls. 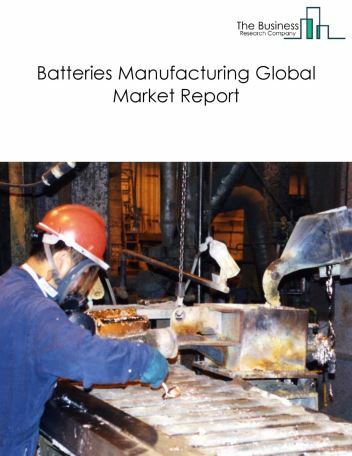 The batteries market consists of sales of batteries by entities that produce primary and storage batteries. Examples of primary batteries include disposable flashlight batteries, dry cells, primary (e.g., AAA, AA, C, D, 9V), lithium batteries, primary, and watch batteries. Examples of storage batteries include lead acid storage batteries, lithium storage batteries, and rechargeable nickel-cadmium (NICAD) batteries. The communication and energy wire and cable market consists of sales of communication and energy wires and cables by entities (organizations, sole traders and partnerships) that produce insulating fiber optic cable, and insulated nonferrous wire and cable from nonferrous wire drawn in other establishments.